Although their religious convictions made them not want to take part in the fighting, three Te Kopuru mates Henry Bradley, Percy Anderson and Ernie Warmington were called up to serve in the First World War. The three mates looking a little weary and grim. They became members of New Zealand Medical Corps, part of the 34th Reinforcements. A single man, Bradley was an engineer at Brown and Son’s Shipyards near Te Kopuru. Warmington, a married man with a baby daughter was also an engineer at the Shipyards. Anderson, a carpenter, was married and lived in Te Kopuru. Training done, they left Wellington on February 8th 1918 aboard troopship Ulimaroa arriving in Liverpool 29th March. The next six months were spent in England working at military camps, including a month at No. 2 New Zealand General Hospital at Walton on Thames. Then, on the second to last day of September, the three Te Kopuru boys were on their way to France. Four days later, on 3rd October, they joined 3rd New Zealand Field Ambulance at the Front. The rest of the sad story is told in a letter probably written to the Bradley family by Mrs Anderson after the death of husband Percy Anderson in 1968. 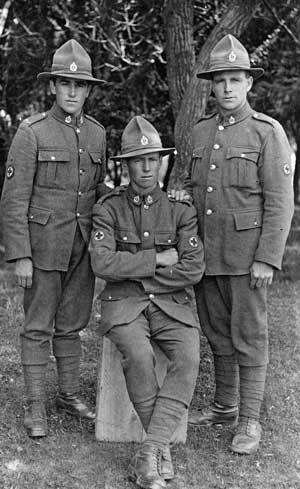 ‘On October 23rd 1918 in France, Henry Bradley, Ernie Warmington and Percy Anderson, “the inseparables” and with Bob Graham of Hamilton, were on stretcher squad duty with 3rd Field Ambulance. ‘The Army was advancing quickly and there were many wounded to pick up. The four boys were walking through a sunken road and repeating the 23rd Psalm. They heard a shell burst close to them. The next one, the one that hit them, they didn’t hear. Several of the boys who have visited us through the years have told me this. ‘Henry was walking around talking, Ernie was lying dead and Bob badly wounded in the spine. Percy was wounded in the base of his skull, a wound that killed him 50 years later. He was also wounded in the shoulder and hit by shrapnel through the thigh. The New Zealand ambulance came along and Percy was lying on the ground trying to get his bandage on. ‘They put Bob and Percy on a stretcher and the boys decided Henry was good enough to walk. By then a doctor had arrived and said, “No! Give the boy a ride it will be his last.” Henry died in the casualty clearing station one week later without really coming to himself. He was hit in the back of the head. He was a fine boy, 22 years old. Percy missed his two mates very badly’. The war was just twelve days from being over. 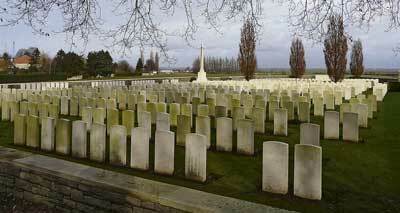 Henry was buried near Cambrai in Awoingt British Cemetery by Reverend F. T. Hines. Ernest lies in a little French village churchyard at Vertigneul. He was aged 23 years and 11 months. A memorial notice in a newspaper on October 23rd 1920 said, “Warmington. In loving memory of my dear husband, Ernest, killed in action France 23rd October 1918. Inserted by his loving wife and wee daughter.